One evening, not long ago, the Rambler sat at the foot of a storm-wrenched willow by the side of the Potomac river. There was no moonlight and a heavy fog hung over the water, shutting it from view. The tide was running in and the soft ripples on the shore could be distinctly heard. Gentle whiffs of breeze disturbed the fog and stirred and fashioned and wreathed it into fantastic forms, and now and then the gray mist seemed to weave and twist itself into the outline of an old steamboat. Perhaps it was the ghost of an old Potomac packet going by., Perhaps the old steamboats which we knew and which we loved still haunt the river, ever and ever going the routes they traveled when they were things of wood and iron! Though we loved them, we often upbraided them for being slow and late, but now we hold them in happy memory. The Rambler feels sure that if steamboats have souls, these old boats are cruising to and fro, up and down, the mighty and majestic river that flows between two old and glorious commonwealths whose history is crowded with honors and great names – Maryland and Virginia. The Rambler watched these strange forms which the mist took on. He even thought that he could hear quick and muffled splashes as though the paddle wheels and paddle boxes of a spectral steamboat were beating on the water. The breeze seemed to bring to his ear low and supulchral whistles as though some phantom steamboat were blowing for a landing. 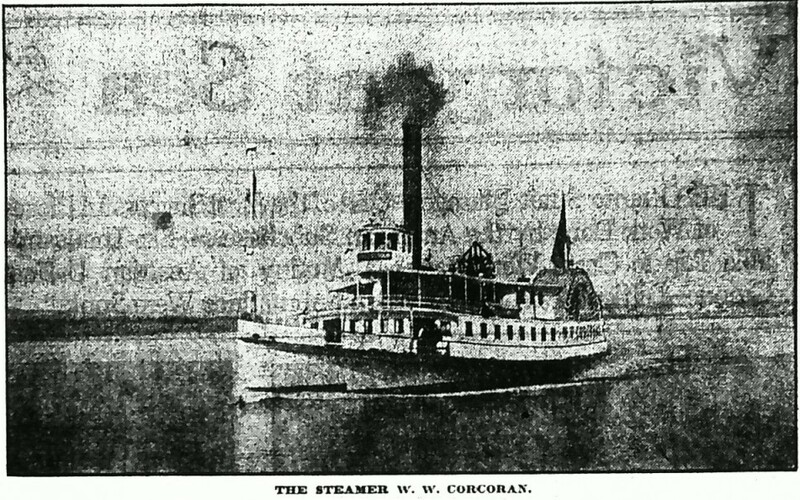 As he drew these pictures in the mist he thought that perhaps there goes the Mary Washington, the George Leary, the Pilot Boy, the Jane Moseley, the Lady of the Lake, the W.W. Corcoran, the George Law, Mattano, Sue, Pents or River Queen. Boats of an older time came floating by, and in the ghostly fleet were the Joe Johnson, the Phenix, Columbia, Union, Thomas Collyer, George Washington, James Guy, Vanderbilt, Keyport, St. Nicholas, Express, George Page and at least a hundred others, and on the wheel box of one of the steamboat ghosts, and one that seemed especially fleet and fleeting, the Rambler thought that he could make out the name “Sidney.” But it was a dark night and she was traveling fast. Following this boat seemed to be three others, and as the Rambler spelled out their names they seemed to be the Powhatan, the Chesapeake and the Augusta. The Ramber could not surely make out the misty forms that stood by the wheel in the pilot house, but one looked like Capt. Charlie Mitchell, another like Capt. Charlie Mitchell, another like Capt. Silas Reynolds and another seemed to be the shade of Capt. Aleck McCausland. Behind the Powhatan, Chesapeake, Sidney and Augusta, which seemed to be hastening to connect with stages at Potomac creek or at Aquia creek for Fredericksburg, Richmond and the south came another shadowy steamboat and one of considerably later style. She was the steamboat Mount Vernon coming up the Potomac and nearly at the end of her run from Baltimore. Going down stream was a boat on her way to Baltimore. She was the Osceola. Of course, as the Rambler looks out through the gray mist at these old steamboats he is conscious that the year is not 1920. He knows that it is 1840. But the images of even older boats than these are passing. The wraith of the first Potomac river passenger and freight steamboat of which there is a record is boing by. She is the steamboat Washington. She was running between this city and Aquia creek in 1815, and may have been running in 1814, but the Rambler thinks that she appeared in the Potomac in 1815. Her first work, and a work she continued for many years, was to transfer stagecoach passengers from Boston, New York, Philadelphia and Baltimore, at Washington, to stage coaches for the south at Aquia creek. The first mention which the Rambler has found of this boat is in an advertisement in the National Intelligencer in 1815, which recites that she “will leave the steamboat wharf in Washington city every day, Sundays excepted, for Alexandria and Fredericksburg at 2;30 p.m.,” and that “by this road and river route the one hundred miles between Baltimore and Fredericksburg can be covered in nineteen hours.” Of course, the Washington did not go down the Potmac and then down the bay and up the Rappahannock to Fredericksburg. She transferred her passengers to stagecoaches at Aquia creek, and these coaches drove through Stafford county, straight across the northern neck of Virginia to the Rappahannock river. Close by the ghost of the steamboat Washington was that of a boat called the Potomac, which, in command of Uriah Jenkins, was running between Washington, Alexandria, Old Point Comfort and Norfolk in the 20s, and “stopping at all places on the Potomac river where passengers can be landed with convenience.” Also, in the 20s, the steamboat Fredericksburg, Capt. Benedict Jenkins, was running between Washington, Alexandria and Baltimore, and it was advertised that “Passengers will be taken up and landed on either side of the Potomac river, and as soon as the necessary arrangements can be effected, fixed places on the route will be designated whereat freight will be received and delivered.” Then, during the 20s there were steamboats called the Dandy, Surprise and Independence, and when they first came under the eye of the Rambler they were ferryboats between Washington, Georgetown and Alexandria. But the fog has lifted from the river and the steamboat phantoms have passed. The Rambler has this thought in mind. He means to write a series of “rambles” on the old steamboats, the old steamboat men, the old “resorts” and the old landing places of the Potomac river, its creeks and its tributary rivers – the Port Tobacco, the Wicomico, the St. Marys, the Yocomico and the Coan. He want to print the pictures of the old boats and the old river men, the captains, mates, engineers, pursers, agents and the rest. He has a pile of notes on these subjects, but he needs the help of the memories of other people. He hopes to get information from officers of the old boats and from their grandchildren. He feels that there ought to be public interest in this sort of thing and that a record of these Potomac subjects ought to be gathered and he will work to that end with such industry as he can. Soon after this steamboat idea came into his head the Rambler walked down to the harbor police office and sat down. It was a familiar place to him. Lieut. Russell Dean and the Rambler are old friends; they were friends 'way back in the days when the Joe Blackburn, who, or which, for brevity and love we called “the Joe,” was one of the proud and “cocky” little steamers of the Potomac. “Russ” Dean was born down in Charles county, near Port Tobacco. He holds a “first-class pilot's license” – that is, a license as pilot “for the Chesapeake and its tributaries, including Hampton roads, and also master of lakes, bays, sounds and rivers throughout the Untied States.” “Russ” served at sea and for a long time was employed on boats of the Maryland state fishery fleet in the work of guarding the oyster grounds or oyster waters. He came to Washington and served on a number of the bay and river steamboats that are now historic. He was appointed on the police force in 1885 and became a member of the harbor police June 6, 1888 serving, among his other duties, as pilot of the “Joe.” That boat, before becoming the Washington harbor boat, had been the yacht of Monroe, a New York publisher, and under his ownership her name was the Edwin N. The “Joe” was named for J.C.S. Blackburn (“Joe” Blackburn) of Kentucky, and, although the facts are not at hand, the Rambler believes that “Joe” Blackburn was conspicuous in bringing about the appropriation for the purchase of a harbor police boat. The Joe went the way that most boats go and was succeeded by the Vigilant, G.A. Tottin is her pilot. He has seen stirring service in the Navy and during the war commanded subchaser No. 233. He was in command of the steamer Booth Bay which broke the ice gorge in the Potomac in 1918, releasing one of the Norfolk and Washington boats. E.G.A. Gaffield, police officer, is also a pilot of the Vigilant. Her engineer is W.K. Gross, the firemen are L.L. Davis and S.P. Smith, the deck hands are C.C. Donaldson and D.H. Young and the watchman is C.D. Little. The other men of the harbor police are Sergt. John E. Preston, Station Clerk H.W. Turner and Officers J.W. White, W.G. Sweet, J.F. Nebb, L.C. Trumbo, J.R. Harrover, W.N. Corbin and W.H. Skinner, night clerk. Private Franklin Monroe was day clerk until February 16, when he was retired after twenty-seven years' servicei n the police department. Somehow or others, as the talk in the harbor office turned to old boats of the Potomac river, the first one mentioned was the Mary Washington and the first of the river captains mentioned was the Mary's first commander, Capt. Gregg. Although it is perfectly proper to class the Mary Washington with the old Potomac steamboats, she was not so very old even when she passed away. Yet she was a famous boat and nearly every Washingtonian traveled on her. For years she was an excursion carrier to the popular river resorts, and the feature which endears her in thememory of so many Washington men and women is that they danced merrily on her decks. She was a dancing boat. Her decks were broad and smooth and the music furnished by the many bands that served on her was said to be always good. The steamer Mary Washington, just completed at Alexandria, makes her trial trip Thursday to Accotink, Glymont and other points on the Potomac river, in command of Capt. Gregg. The boat, which has cost about $20,000, is 150 feet in length, breadth of beam 45 feet, and she draws, with her machinery on board, only twenty inches of water. She has been built from plans and designs by Dr. John Grimes of Pittsburgh, under whose supervision she was constructed. Her model is of the Ohio river plan, designed to run anywhere that a heavy dew can be found if necessary to receive or land a passenger or a barrel of freight. Her engines are new, of 350 horsepower and were constructed by Moore & Co. of Alexandria. Her boilers were made by Pettit & Co. of the same city. There was quite a celebrated legal contest in 1874 between the Mount Vernon management and the steamboat Arrow and the Mary Washington over the right of the Mary to land at Mount Vernon, the Arrow then being the “regular” Mount Vernon boat. J. McH. Hollingsworth was the superintendent of Mount Vernon and Frank Hollingshead was captain of the Arrow. Capt. Gregg seems to have been soon succeeded in command of the Mary Washington by Capt. Troth, and the Rambler believes that “Capt. Troth” was Jacob Troth, one of the Woodlawn Quakers. One of the very early “rambles” – though they were not then called by that name – was on the subject of Woodlawn Mansion, the great home which George Washington presented to his ward and adopted daughter, Nellie Custis at the time of her marriage to Washington's nephew, Lawrence Lewis, in 1799. Loitering in the garden of Woodlawn, the mansion being at that time tenantless, he came upon an old gentleman who lived on a property adjoining Woodlawn, which is about two miles southwest of Moutn Vernon mansion and on a ridge back from the old road that leads to Accotinc village. The name of the man was Jacob Troth, one of the Quaker pioneers who came from Burlington county, N.J., in the 40's and bought a large acreage of the western lands of the Mount Vernon plantation, including the Woodlawn property, which they bought from Lorenzo Lewis, who had inherited the place from his parents, Lawrence and Nellie Custis. The Rambler made a picture of Mr. Troth standing at the main doorway of Woodlawn and he believes he has that picture yet. As the Rambler recalls it, Mr. Troth said that he was going out to Los Angeles to live and the memory of the Rambler is that he died there. Occoquan Falls, Marshall Hall and Glymont. – The steamer Mary Washington will make excursion trips to the above places. To Occoquan Falls every Wednesday, leaving 7th street wharf at 9 a.m. And returning at 8 p.m.; fare 25 cents. Marshall Hall every Saturday; fare 15 cents round trip. Sunday excursion, Marshall Hall and Glymont. Dancing on a fine waxed dancing deck down and back on all trips except Sunday. Fine brass band on Sunday, E.S. Randall, Manager. The Ramber has not used all his notes relating to the Mary Washington and will resume the story next Sunday.